Moscow is one of the most exciting places to include in your tour to Eastern Europe because it has so much to offer to its visitors. If you are looking for delicious kosher food, it has that waiting for you too. Moscow’s Jewish and non-Jewish people alike are searching for top-quality kosher food, and they enjoy eating at kosher eateries and having a tasty cup of coffee with a piece of cake, or a refreshing cocktail. Moscow’s kosher scene is growing fast, and there are restaurants, bars, and cafés opening every day, so here are some amazing places for you to eat and drink at with gusto. On the top floor of the Bolshaya Bronnaya Synagogue, you’ll find one of the Moscow’s oldest kosher restaurants with a lovely, welcoming atmosphere, reasonable prices, and friendly staff. It’s very popular among the local Jewish community. The contemporary menu offers a truly vast choice of courses, such as great BBQ meats, many lamb dishes, fresh fish served with house-made sauces, delicious soups and salads and, of course, must-have desserts, all best-enjoyed with some tasty Israeli wine. Its Middle Eastern cuisine is combined with the traditional cuisines of Eastern Europe and the Caucasus. Another excellent restaurant with an enjoyable décor is Jaffa Restaurant, certified by the Chief Rabbinate of Russia. It serves Israeli and Middle Eastern cuisine, especially meat and fish dishes, including grilled sea bass, cod meatballs, sushi, lamb kebabs, eggplant with lamb, latkes with smoked salmon cream, chicken with potatoes, salads, sesame ice cream filled with fruits and covered in chocolate and caramelized nuts, and much more. Also, you can buy tasty homemade jams to go. In addition to excellent prices, the atmosphere is home-like and peaceful, and the staff very friendly. The first kosher sushi restaurant has opened in Moscow recently, located between the Marina Roscha Synagogue and the Jewish Museum and Tolerance Centre, under supervision by Russian Chief Rabbi Berel Lazar. Russian people love sushi, so other kosher restaurants have been offering it for a long time, but this is the first restaurant which almost exclusively serves sushi rolls. It offers more than a hundred different types of sushi, many of them named after places in Israel, including sushi with a caviar imitation which combines traditional Russian and Japanese foods, and a fusion of Japanese and Middle Eastern cuisine. Tasty! Laflafel is a smaller place with a smaller menu than our previously mentioned restaurants, but it’s so worth your visit! This eatery is so popular that there are often queues outside. The reason is simple: the combination of tasty and fresh food, reasonable prices, excellent service, and great atmosphere. There are two menus to choose from here – kosher and Indian. All dishes are cooked with fresh ingredients delivered that morning and with interesting, appetising seasoning. Its customers praise the restaurant’s homemade hummus served with fresh salad. It is also a great place for vegans and vegetarians. In the heart of Moscow, you’ll find an Israeli bar famous for its menu and amazing cocktail and wine lists. Upon entering the very popular and always full Mitzva Bar, you’ll go down the stairs into two chambers with carefully thought-through decoration. The interior and the atmosphere are dark, but very cosy, slightly mystic, even theatrical. The menu looks like a papyrus roll, and all dishes are traditional and simply delicious. The bread alone is praiseworthy. Prices are reasonable, and the service is excellent. There is no cocktail menu, but the barmen will make you a drink according to your taste and wishes, using homemade ingredients, and will even tell you a story behind your cocktail. A top-quality Israeli café in downtown Moscow that gets very busy as soon as it opens its doors is Dizengoff 99. 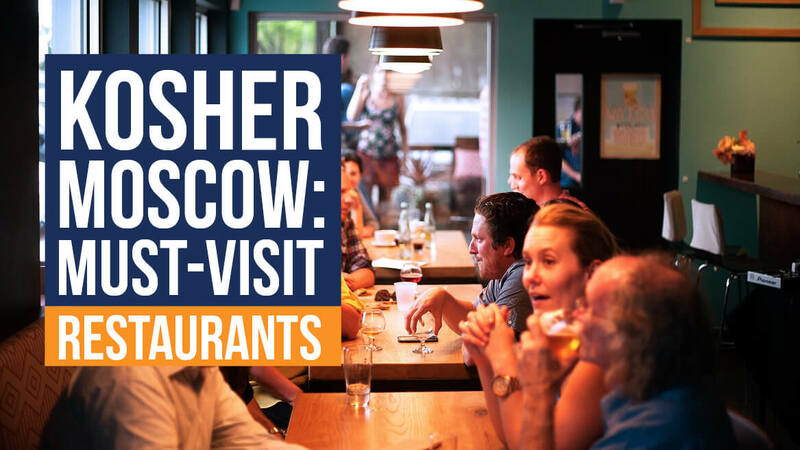 First opened in Tel Aviv, it’s one of the locals’ and tourists’ favourite kosher eateries in Russia’s capital. The place is very comfortable, with a warm atmosphere, helpful staff, and a lot of dishes to choose from. The humus is fantastic, there are many beverages and desserts to try, and everybody loves Dizengof 99’s falafel! If you go there later in the evening, it’s less crowded and you’ll even get a 50% discount on humus or the breakfast menu. The kosher branch of ‘Chocolate Seller’ or Shokoladnitsa is very popular with both Jewish and non-Jewish people. You might want to try their excellent breakfast menu, or lunch and dinner sets. How do potato pancakes with an egg and smoked salmon on the side sound? How about some yummy Belgian waffles served with home-made vanilla ice-cream? Perhaps you are more of a pancake with chocolate filling and whipped cream person? The food is fresh here, but so are the tasty freshly squeezed juices! The menu is so diverse that you’ll have a hard time choosing just one dish, but the friendly staff is there to help.